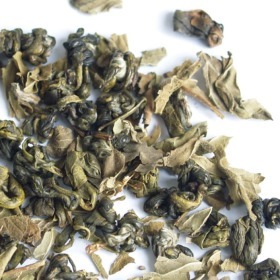 Green Mint Tea combines Gunpowder tea from China with fresh peppermint leaves. This Green Mint Tea is also known as atay bi nahna or Moroccan Mint Tea, which is the national drink of Morocco, and is an integral part of Moroccan hospitality. Green Mint Tea can be drank with sugar or withour sugar. A steaming glass of the fragrant, sweet, light tea is offered as a sign of welcome. It is drunk in the morning, offered throughout the day while bargaining, conducting business, or wandering about, and served at the end of the meal to aid digestion. Refreshing, sweet and minty green tea. Green tiny pellet with dried peppermint leaves. Very refreshing mint tea. I like it cold too! Have to say not too keen on this one sorry.